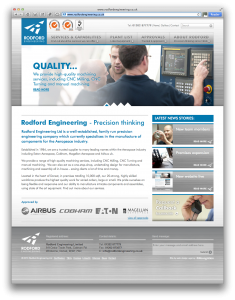 Rodford are a precision engineering company based in Wimborne, Dorset. They approached Recognition as they didn’t have a web presence and also wanted their brand identity updated. Based on Rodford’s requirements and the needs of their customers, Recognition planned out the content and sitemap and also wrote the website copy, before starting on the designs. Photography was taken at Rodford’s factory and used within the chosen design. The website uses the adaptive design technique, which ensures optimal viewing experience—easy reading and navigation with a minimum of resizing, panning, and scrolling—across a wide range of devices (from desktop computer monitors to mobile phones). The brand was also given a refresh. Based on the original triangle that Rodford had used for some time, Recognition gave it a modern twist, by incorporating the R of Rodford and tilting it to the side to reflect that their client based is in the Aerospace industry. See more examples of websites designed by Recognition.